Our cloud-covered planet is seen from aboard the International Space Station. One year ago on August 21, 2017, the continental United States experienced the first total solar eclipse in 99 years. NASA astronaut Ricky Arnold photographed a massive storm in the Pacific Ocean during a flyover from the International Space Station. Arnold shared images on social media on Aug. 22, 2018, and wrote, "#HurricaneLane in the early morning hours near #Hawaii. The crew of the @Space_Station sends much aloha to everyone there." The world is on fire. Or so it appears in this image from NASA's Worldview. Even if the air looks clear, it is nearly certain that you will inhale millions of solid particles and liquid droplets. These ubiquitous specks of matter are known as aerosols, and they can be found in the air over oceans, deserts, mountains, forests, ice and every ecosystem in between. Striking atmospheric features in Jupiter?s northern hemisphere are captured in this series of color-enhanced images from NASA?s Juno spacecraft. Astronauts get to observe the Earth in all her beauty from aboard the International Space Station. A member of the Expedition 56 crew currently onboard the station took this nighttime image of Java, Indonesia's largest island. An expedition that will help NASA search for life in deep space launched today ? not with a rocket?s roar, but with a gentle splash into the deep Pacific Ocean. The project will use underwater robots to explore the environment around a deep-sea volcano off the coast of Hawaii that has similar conditions to what may exist on Saturn?s moon Enceladus. 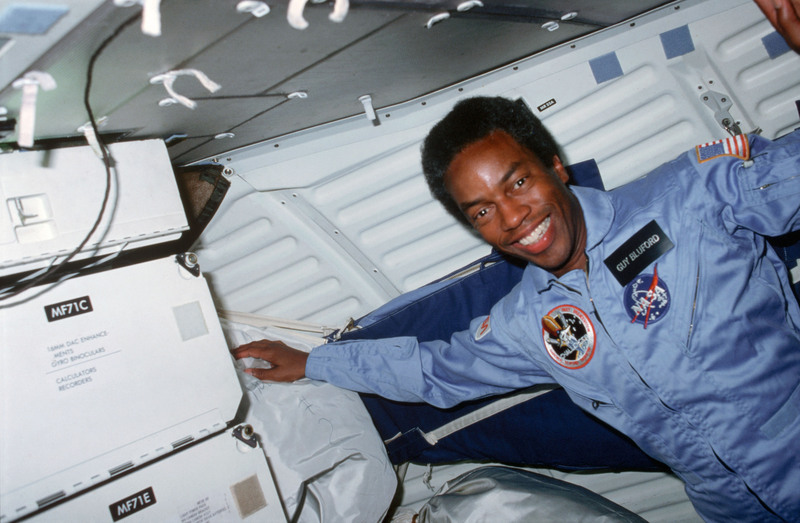 Guy Bluford, the first African-American astronaut, launched into space on shuttle Challenger's STS-8 mission thirty-five years ago, on August 30, 1983. The little-known nebula IRAS 05437+2502 billows out among the bright stars and dark dust clouds that surround it. Long, narrow clouds, known as ship tracks, stood out against the backdrop of marine clouds blanketing much of the North Pacific Ocean. A truck sprays water to reduce the dust as NASA's crawler-transporter 2 with the mobile launcher atop moves slowly along, on its trek to Launch Pad 39B. Over a mere four days this summer, snow from the previous winter melted into a pond of slush a glaciologist called a ?snow swamp.? 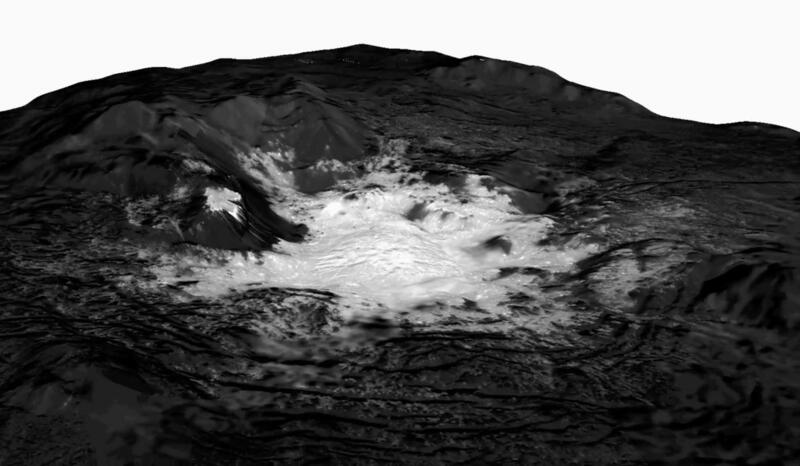 Bright surface features on the dwarf planet Ceres known as faculae were first discovered by NASA's Dawn spacecraft in 2015. Astronaut Ricky Arnold, from aboard the International Space Station, shared this image of Hurricane Florence on Sept. 10, taken as the orbiting laboratory flew over the massive storm. Ever stared down the gaping eye of a category 4 hurricane? It's chilling, even from space. NASA completed the final test to qualify Orion?s parachute system for flights with astronauts, an important milestone on the path to send humans on missions to deep space. 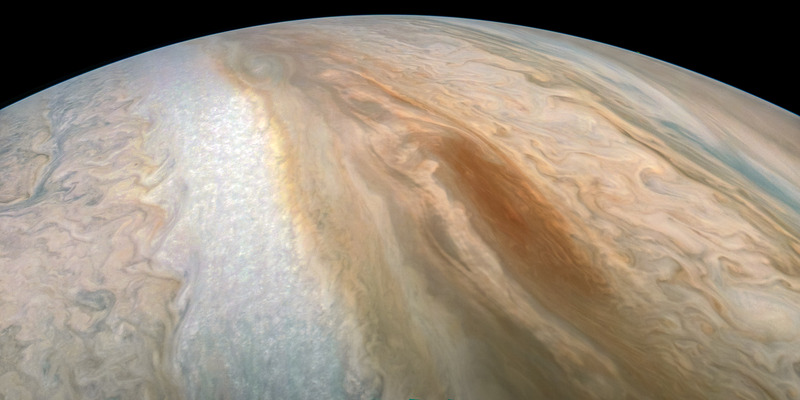 A long, brown oval known as a "brown barge" in Jupiter's South Equatorial Belt is captured in this color-enhanced image from NASA's Juno spacecraft. A Delta II rocket launches with NASA's ICESat-2 onboard, Saturday, Sept. 15, 2018, from Vandenberg Air Force Base in California. Astronaut Serena Auñón-Chancellor examines her eye with a Funduscope. Du möchtest einen Link zu diesem Thema "Celebrating the 50th Anniversary of Apollo 8's Launch Into History" setzen?